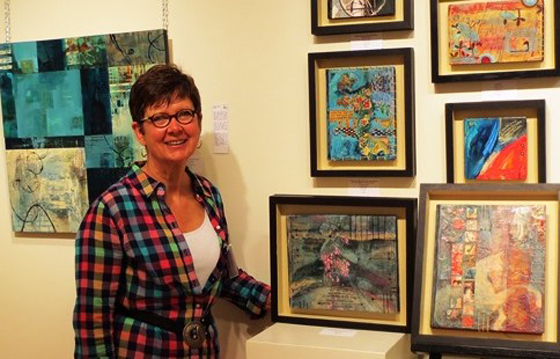 Gwen Gunter's layered abstract paintings reflect her richly varied life experience. Always eager to explore new avenues of artistic expression, she has amassed a body of experience that informs her personal vision. She has been a graphic artist, illustrator, photographer and successful entrepreneur with her own line of functional art items for the home decor, gift and apparel industries. She has served as the artist for the South Carolina Department of Agriculture and as graphics director for a communications company, a management consulting firm as well as a paper products manufacturer. In the commercial arena, she has licensed art for art posters, note cards, scrap booking and even paint by number. Her main focus and passion has always been as a painter. Early in her career she was a representational painter of traditional landscape and still life, exhibiting in Georgia and the Carolinas. Then after further study at the Atlanta College of Art, she began the transition into contemporary art. Always searching for the perfect balance between narrative and image, she now finds in abstraction the most meaningful vehicle for her unique storytelling. Based in Atlanta, she devotes her energies full time to the painting adventure. Recently, my work has become reflective of the interplay of mechanical processes and the spiritual impetus that underlies all creative expression. Incorporating elements of my background in graphics and commercial art, I have been exploring the richly layered landscape of technology as it enhances rather than obscures fine art today. This is a series of paintings made on the covers of old books. I enjoy writing the first lines of novels which pose a question or make an observation that would, of course, be explained as the story unfolds. However, I don’t write the novel…I just like the first lines. These small “book paintings” incorporate the first line of a potential novel and a visual interpretation. After the painting is complete, each book is sewn or laced closed, further emphasizing that the work will remain a mystery.